A large circular lacquer dish, with flat well and rounded sides, supported on a short, straight foot. 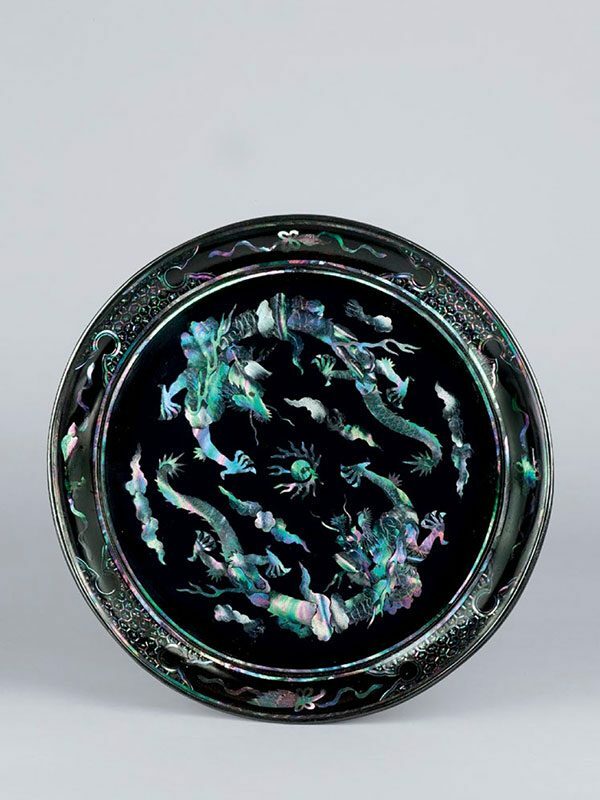 The interior of the dish is inlaid with carefully selected pieces of mother-of-pearl with a bold decoration of two five-clawed dragons among clouds, together encircling a flaming pearl in the centre. The cavetto is divided into eight sections, alternately adorned with four different Buddhist emblems and with hexagonal diaper patterns. The exterior and the base of the plate are unadorned and covered in black lacquer. Very fine quality mother-of-pearl inlaid lacquer plates of this type with double dragon decoration exist in various sizes and were used by the Ryukyuan court in the 18th and 19th century. Some were sent as tribute to the Chinese court; it is recorded in the Lidai baoan (A Chronicle of Regulations) that lacquer ateliers of the Ryukyu produced trays similar to this example as tribute to the Chinese imperial court at Beijing. Sets of thirty bowls and thirty trays were presented to the Qing emperor in the years 1725, 1740, and 1788. Examples of similar five-claw double-dragon circular dishes are preserved in the Palace Museum, Beijing, Los Angeles County Museum of Art, the Tokugawa Art Museum, and the Muwen Tang collection. Another, much larger tray with closely comparable decoration is in the Irving collection at the Metropolitan Museum of Art in New York.